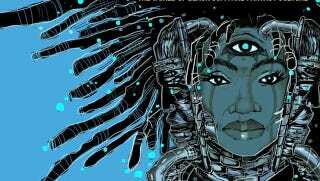 Ytasha Womack, the author of Afrofuturism: The World of Black Sci-Fi and Fantasy Culture, is here to answer your questions today! In addition to Afrofuturism, she's also the author of Post Black: How a New Generation is Redefining African American Identity and 2212: Book of Rayla. Her credits as a filmmaker include Love Shorts and The Engagement. She'll be joining us from 11:30 a.m. - 12:30 p.m. (PDT), so start submitting your questions now about her books, sci fi, and writing in the comments below! Image: John Jennings / Ytasha Womack.